Black Umfolosi is a self taught Acappella (Imbube) singing and traditional dance group that was formed in 1982 by the then school age members who wanted to develop themselves and contribute to their community. Specialising in imbube music, gumboot dance and Zulu dance, Black Umfolosi has toured extensively nationally and internationally –Europe, USA, Canada, Australia and Asia. They have represented Zimbabwe at international events such as Expo 1992 in Seville, Spain and the 1994 Commonwealth Games in Victoria, Canada. Black Umfolosi is a self taught Acappella (Imbube) singing and traditional dance group that was formed in 1982 by the then school-age members who wanted to develop themselves and contribute to their community. Specialising in imbube music, gumboot dance and Zulu dance, Black Umfolosi have since toured internationally and have enchanted the people of Europe, USA, Canada, Australia and Asia with their fantastic harmonies, energetic dancing and gentle humour. Black Umfolosi have also represented Zimbabwe at international events such as Expo 1992 in Seville, Spain and the 1994 Commonwealth Games in Victoria, Canada. Their performances are energy driven and completely engaging, mixing a great gentleness of spirit and song with an exuberance in dance. Their trademark harmonies mixed with intricate rhythms, clicking and clapping are highlighted during their brilliantly choreographed shows with a full range of movements from subtle to vibrant stomping and leaping! Black Umfolosi Performing Arts Project is registered as a company. It is also registered with the Zimbabwe Ministry of Education, Sport, Art and Culture, as well as the Zimbabwean Arts Council. It is affiliated to various organisations, including the Zimbabwe Music Rights Association. The mission statement of Black Umfolosi Performing Arts Project is: TO PROMOTE, PRESERVE AND PERFORM SOUTHERN AFRICAN TRADITIONAL MUSIC AND DANCE, WHILE CREATING LINKAGES WITH INTERNATIONAL, CONTEMPORARY AND TRADITIONAL PERFORMING ARTS GROUPS.To achieve this mission, Black Umfolosi seeks to: To create employment for its members.use the Arts in addressing various social, economic, cultural and topical issues.use the Arts as a vehicle for promoting social harmony and understanding amongst people of different backgrounds. Black Umfolosi are, without a doubt, Zimbabwe’s number one a cappella song and dance performing company with over 30 years of touring and stage experience. Based at the Enkundleni Cultural Centre in Bulawayo, Zimbabwe, Black Umfolosi take their name from the Umfolosi River that flows through the Natal province in South Africa. Some of the fore-fathers of the Matabele tribe came from the banks of the river. The group came together by chance in 1982 as a means of entertaining themselves whilst still at school, not long after the independence of Zimbabwe. Then aged between eight and sixteen, their first production was a series of traditional songs performed at their school in support of their football team. This led to performances at local festivals and trade fairs resulting in African and International tours. Black Umfolosi are one of the first to admit that the political upheaval and stresses of the eighties in Zimbabwe gave them a unique opportunity to contribute to the history of the country through their song, “Unity” which is still being aired today. Black Umfolosi is an internationally acclaimed group that has conquered the world through more than 30 year career, he also defended the Imbube tradition with their a cappella performance that is found in both South Africa and Zimbabwe. It has often been compared to the South African vocal group Ladysmith Black Mambazo, made world famous group by its participation on the Paul Simon album Graceland. 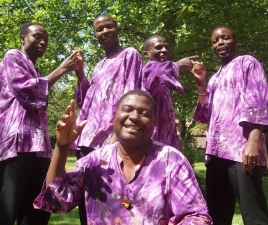 Black Umfolosi is a self taught Acappella (Imbube) singing and traditional dance group that was formed in 1982 in Bulawayo by the then school age members who wanted to develop themselves and contribute to their community. Specialising in imbube music, gumboot dance and Zulu dance, Black Umfolosi has toured extensively nationally and internationally –Europe, USA, Canada, Australia and Asia. They have represented Zimbabwe at international events such as Expo 1992 in Seville, Spain and the 1994 Commonwealth Games in Victoria, Canada. THE story of successful musical groups splitting because of power and money struggles has been overwritten in Zimbabwe so much that it is no longer news. But the opposite story of a successful group that has remained united despite its success and fame, which has not allowed “the root of evil” to destroy it, Zimbabwe’s oldest imbube acapella outfit, Black Umfolosi, is indeed worth shouting from the top of the mountain. So successful has been the group that it has been able to tour most parts of the world establishing itself as a true African musical ambassador. Audiences who have watched them perform acknowledge the exciting blend of African dance and beautifully-crafted acapella harmony singing that has attracted crowds all over the world. As a child, I grew up to the music of Lovemore Majaivana, Busi Ncube, Oliver Mtukudzi and Black Umfolosi, among many other outstanding local acts. Though at times I was not sure of the artists’ real names, I would still sing along to the music that I would hear playing on the radio. For instance, the song True Love by Busi Ncube; most of us still remember the song, its melody, the groove and we could also sing along to it. Zimbabwe’s oldest imbube acapella outfit, Black Umfolosi say they might be down but not out as they are working on a new production. More than three decades on the music scene, Zimbabwe’s a cappella ambassadors, Black Umfolosi, continue to delight audiences around the world. Formed by young school friends, the group was named for the Umfolozi Omnyama River where their ancestry can be traced. Their performances are inspired by the traditional song and dance of their native Africa, and conveyed with unrivaled beauty and passion. With melodic harmonies mixed with intricate rhythms, clicking and clapping; accompanied by movements from the subtle to vibrant stomping and leaping; every show blends gentleness of spirit with exuberant dance and song. The wonderful result is a completely absorbing performance. THE quest to continue exports of Zimbabwean culture to the world continues for leading imbube and traditional dance ensemble Black Umfolosi currently on a month-long tour of Canada. Formed way back in 1982 by a group of schoolmates, Black Umfolosi has over the years become one of the country’s leading cultural ambassadors. During their current Canadian tour, they are showcasing their latest project, a 12-track album titled Umhlaba. The album was produced by Dumisani Ramadu of Walks of Life fame and was released in June under the Austria-based 10th District music label. Group spokesperson Thomeki Dube said the group was on the last leg of the tour that began on July 2 in Ontario. “Currently we are in British Columbia where we are showcasing at the Bella Coola Music Festival which got underway on Friday 17 July and will run until Tuesday 21 July. We have been performing all across Canada at big outdoor festivals since it is summer and we will be rounding off the tour with more performances in Mission, British Columbia from 23 to 26 July,” Dube said. There are six group members on the current tour — Dube, Sotsha Moyo, Austin Chisare, Alec Ncube, Brian and Thethelela Moyo. SINCE maiden European and world tour in Glasgow, Scotland in 1990, scathamiya group Black Umfolosi has wowed crowds with their stagecraft. The group has risen to international success spiced up with local performances to regain their energies. “It all started in Glasgow at the May Fest, an annual city-wide festival of popular theatre and music featuring performers from around the world,” group member Sotsha Moyo told Southern Eye Lifestyle. “The organisers of the festival were responsible for touring groups and for that particular year they wanted groups from Southern Africa to participate. The self-taught scathamiya, a cappella or imbube group has been called for yet another month-long Canadian tour from June to July. It's rare that Britain is visited by a group of all-singing-all-dancing Zimbabwe Christians, but - unnoticed by most of our churches - this is precisely what happened this year on Black Umfolosi's mammoth European tour of schools, colleges, theatres and arts centres. At a time when most Christians strive to perform in non-church venues, Black Umfolosi had to specifically request gigs in churches, simply to provide some variety. The group were relaxed and talkative when I caught up with them in South London, in temporary occupation of a college hall of residence outside term-time. 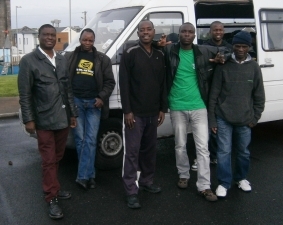 The group were staying there between visits to Sweden and Ireland, on a European tour which began in March. Please check back soon for Black Umfolosi's tour schedule.